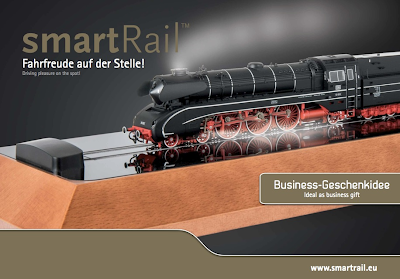 Roco has just sent us the latest brochure for the exciting Roco/Fleischmann smartRail digital locomotive stand. We have had a demo model in our store for a few weeks now and have to admit that they have done a fantastic job creating this product. For those who have always wanted a way of displaying your digital locomotives on your desk or anywhere away from your layout, this is the product for you! Roco is billing the smartRail as the perfect executive desk accessory and we can't imagine anything better. With a full Roco z21 wireless digital system built in (allowing control via your smartphone/tablet or the touch buttons on the smartRail base) and its unique 'treadmill' design, the smartRail is definately a great way to show off your locomotive investments!